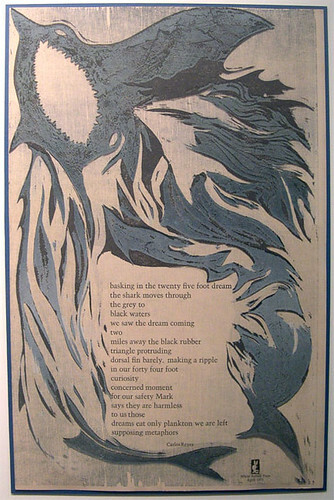 Home » Galleries » Past Shows » 2006-2007 » Preus Library » "How The Ink Feels"
This exhibit features a selection of letterpress broadsides that illuminate poetry and prose selections by well-known writers. Most pieces were printed using manually operated letterpresses, a technique that has changes very little since the Middle Ages. 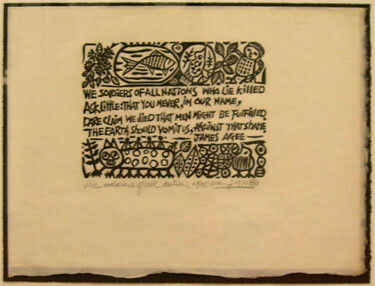 The pieces are collaborations among the printer, the writer, and the artist – papermaker, woodcut illustrator, calligrapher or paper maker. 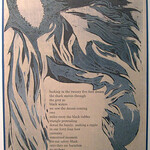 The broadsides are on loan from the Estate of William Stafford, Karla Elling (Mummy Mountain Press), Sandy Tilcock (lone goose press), Carlos Reyes (Trask House Books), Naomi Shihab Nye, and Ingrid Wendt. Caretaker of the exhibit is Friends of William Stafford, Advocates for Poetry. William Stafford (1914-1993) was one of American’s most celebrated poets. Author of over sixty books, Stafford was a witness for peace and honesty. He was Poetry Consultant to the Library of Congress, and received numerous prestigious awards internationally and in this country, including The National Book Award for Poetry. Artists in the exhibit include Karla Elling, Dan Ellis. B. Halperin, Max Hein, William Houston, Hui-Ming Wang, J.B. Graves, Darryla Green-McGrath, Tom Killion, Maurice Lapp, Stephan Leflar, Susan Lowdermilk, Elizabeth Quandt, Edie Roberts, Alan James Robinson, Micah Schwaberow, Barbara Stafford, Sandy Tilcock, and Patricia Waters. Writers include James Agee, Agha Shahid Ali, Marvin Bell, Wendell Berry, Robert Bly, Madeline DeFrees, Ivan Doig, Rita Dove (U.S. Poet Laureate), Martin Espada, Vi Gale, Tess Gallagher, Donald Hall, Ursula K. Le Guin, Mark Halperin, Joy Harjo, Robert Hass (U.S. Poet Laureate), Jane Hirshfield, Richard Hugo, David Lee, Li-Young Lee, Denise Levertov, Barry Lopez, Sandra Lopez, Stanley Kunitz (U.S. Poet Laureate), Chris Merrill, W.S. 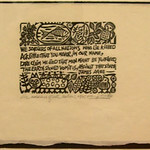 Merwin, E. Ethelbert Miller, Howard Nemerov (U.S. Poet Laureate), Naomi Shihab Nye, Paulann Petersen, Carlos Reyes, Alberto Rios, Ralph Salisbury, Gary Snyder, Richard Shelton, Peggy Shumaker, Primus St. John, Kim Stafford, William Stafford, James Welch, and Ingrid Wendt.